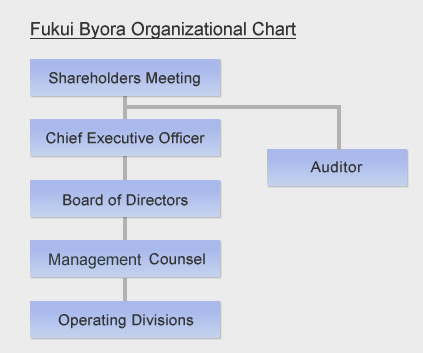 Corporate Governance | Fukui Byora Co., Ltd. The Fukui Byora group aspires toward continual development by fashioning “Superior products with Creativity, Passion and Harmony" while creating a societal partnering, environmentally conscious organization, which enhances comfortable lifestyle. Furthermore, we follow a policy of transparency, abiding by applicable corporate law and adhering to acknowledged practices of corporate governance. At all times, we endeavor to increase trust, thereby increasing value to all our customers, shareholders, partners, employees.